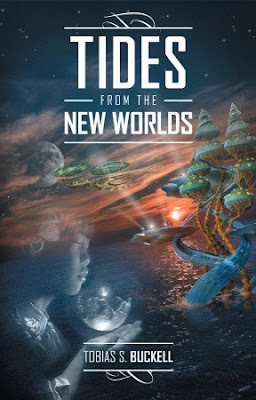 Tobias Buckell is a brand name I associate with novels but occasionally, I'd hear of a fantastic short story written by the author so I was eager to tackle Tides from the New Worlds which is a collection of his short stories. What becomes evident over the course of twenty short stories is that while Buckell has minor improvements in his writing style, for the most part he already had a grasp of his own voice and technique early on. For example, in his novels, Buckell tends to focus on the conflict and plot. That hasn't really changed when he transitions to short stories but because of the limitations of length, as readers we latch on to those qualities and in many ways, they work better in this format. Those coming from a Literary (with a capital L!) background might be disappointed. Whereas such readers might be looking for experimental styles or a heavy focus on description and character, Buckell is the opposite. He's accessible with his direct language, and a good chunk of his narrative focuses on plot. There might also be a misconception that Buckell's character's aren't fleshed out but that's not the case. Instead of chunky descriptive passages, Buckell boils them down to their core characteristics and the rest are discovered through the character's actions and dialogue. A good number of stories in Tides from the New Worlds, especially early on, leans toward science fiction and its tropes. To a certain extent, that's the atmosphere Buckell is trying to conjure. Even when he's tackling the fantastical, which is the case with "In Orbite Medievali," it's more of a fusion of science fiction and fantasy. In that particular story, Buckell successful channels the voice of a certain period and there's all this dynamic interactions between the characters, from the pious to the pioneering. That's not to say Buckell can't do fantasy: "Something in the Rock," a story exclusive to this collection, is this secondary-world fantasy with all that Tolkienesque baggage. What makes it unique however is the way the author focuses on his protagonist, fleshing out the culture and mindscape of dwarves, instead of relying on cardboard cutouts. Another prevalent--but not exclusive--theme in Buckell's stories is the Caribbean element. As someone who reads Philippine speculative fiction, penning down the specifics of what makes a story regional can be difficult. Sometimes, it's overt, such as the inclusion of Caribbean characters or cultures. At other times, it's more indirect, such as the prevalence of ships and the traveling motif. There's probably stories that don't sound Caribbean to a foreigner like me but Caribbean readers will identify as their own. Having said that, not all of the stories are perfect. Some feel too short as Buckell only provides you with his central thesis then leaves you hanging, which was how I felt with "Trinkets." Occasionally, blunt didactism ends the story, sometimes to explain a moral, other times to make sure the reader understood what happened. And some will be considered as flaws but I see it more as the author embracing the conventions of his genre, from exposition to the need to explain how things work. Still, despite those weakness, subjective or otherwise, Buckell is quite compelling and appeals to the reader who's interested in science fictional ideas or those looking for a story where something clearly happens.